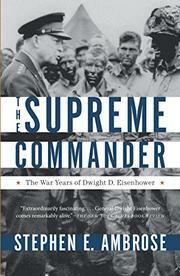 Stephen Ambrose elected to describe the war years of General Eisenhower from Eisenhower's own frame of reference, an approach which is valid for a biographical study and effectively executed here, but is certainly not without its drawbacks. By describing Eisenhower's wartime service in the terms that Eisenhower himself saw it, Ambrose illuminates the way in which Ike operated, the manner in which he weighed alternatives and made decisions, and to some extent, the way his decisions affected the outcome of the war. This conveys a feeling for the man (largely appreciative) and a sense of the scope of his responsibilities. On the debit side, however, there is no balancing perspective to put Eisenhower in his historical place, no critical voice to suggest how things might have been done differently or what other approaches to problems were possible. Ambrose does not attempt or pretend to deal with the political and moral aspects of the war, accepting Eisenhower's own conception of himself as "a straight-from-the-shoulder, single-minded soldier," an essentially apolitical agent executing rather than setting policies, sustained by the support of his superiors (especially Army Chief of Staff George C. Marshall). Within the limits of this treatment, Ambrose has produced a fine account of the American and Allied war effort in Europe, factually detailed but personally involving.